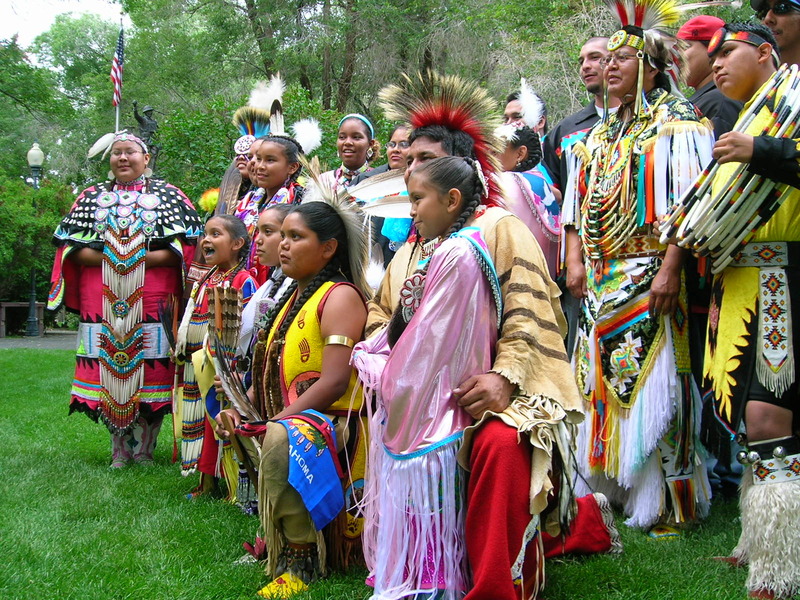 Shoshone dancers participate in International Day, which celebrates the diverse history and heritage of Rock Springs. Rock Springs, Wyoming, (population 18,708) was described in an 1850 report by Captain Howard Stansbury, who noted the abundant coal outcrops along the ridges that flanked the valley. The U.S. Army later used his report to locate a military road through Bitter Creek to Fort Bridger and the Salt Lake Valley, which became known as the Overland Trail. In 1862, the first settlement at Rock Springs, an Overland Trail station, was built along Killpecker Creek. The town expanded in 1868 with the opening of coal mines and a small hotel. The mines grew larger with the arrival of the Union Pacific and other coal companies. The burgeoning mine industry needed a large work force, and many immigrants came to Rock Springs to work. By 1870, Chinese workers became the largest ethnic group in the mines. In 1885, racial animosity directed toward the Chinese erupted into the Rock Springs Chinese Massacre, which left 28 Chinese dead and Chinatown burned. U.S. Army troops built Camp Pilot Butte to guard the rebuilt Chinatown, and continued to do so until 1898. Coal mining allowed Rock Springs to flourish and become the social and economic nexus of the region. The city continued to have a large influx of immigrant labor and became known as the “Home of 56 Nationalities.” The Great Depression slowed the economy of Rock Springs, but it was most severely impacted in 1950, when steam locomotives were replaced with diesel railroad engines. By 1963 all of the Rock Springs mines were closed. The extraction of trona, a relatively rare mineral, oil and gas, as well as agriculture, sustained the town, but without the stable coal industry, the town has been subject to economic upheaval. Rock Springs recently developed a walking tour through its downtown historic district, with a brochure including pictures of sites, a map, and descriptions. The publication acquaints visitors with local history, and draws them to sites including the original railroad depot, “ghost signs” on downtown buildings, and a statue dedicated to local miners. Volunteers, working with Rock Springs’ Certified Local Government program and the Rock Springs Historical Museum, did the research and writing for the brochure, and the city of Rock Springs funded the printing. The museum, the chamber of commerce, and local hotels display the tour brochures, and the tour has led to an increase in downtown visitors. The city celebrates a number of activities recognizing the many nationalities that have made up Rock Springs. “From the Melting Pot” is a program run by the Rock Springs Historical Museum and the Sweetwater County Museum in which locals teach ethnic cooking classes. International Day is a special tribute to the many nationalities that make up the “melting pot” of Rock Springs. The cultural festival includes musical performances and booths featuring ethnic goods and displays. The festival is sponsored by the city, based on a historic program instituted by the Union Pacific Coal Company in 1922. The city reinstated International Day during the Rock Springs Centennial. Rock Springs is a Main Street community and a supporting member of Tracks Across Wyoming, which preserves and promotes the heritage of the Union Pacific Railroad and Lincoln Highway corridors across southern Wyoming. The Bureau of Land Management is developing a historical trail tour that will include Rock Springs.